Part ONE—Merry Christmas!!!! Thanks for taking this journey with me these past 25 days! I hope I have made you smile! This is one of my Christmas presents! 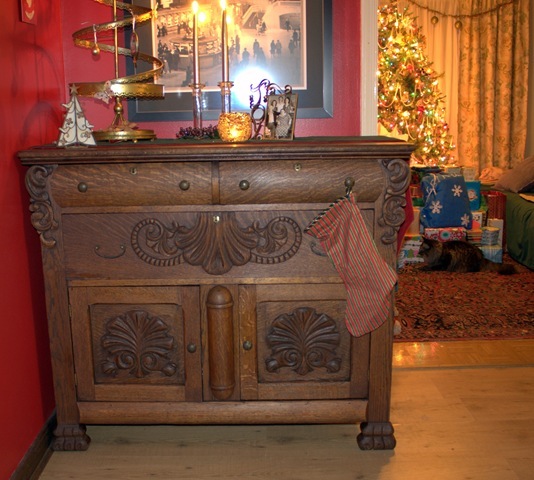 My husband refinished (and enhanced structurally) this credenza, that was owned by my great-great grandparents. I don’t know how old it is, but they got married in 1890; I would think maybe they bought it when they moved to Staten Island from Brooklyn and bought the house on Amboy Road. I inherited it in 1985 or so, when my Great Aunt Gene was moving out of the house to retire to South Carolina/Florida. It moved from Ellicott Place to Colonial Heights with me in 2002, but when we bought our house in 2003, it moved into the garage as it was no longer willing to stay upright and hold stuff. Since then, I have been waiting patiently (smile) for Timmy to get up the nerve to tackle this project! I told him I wanted it for Christmas this year, and that seems to have been the push he needed! 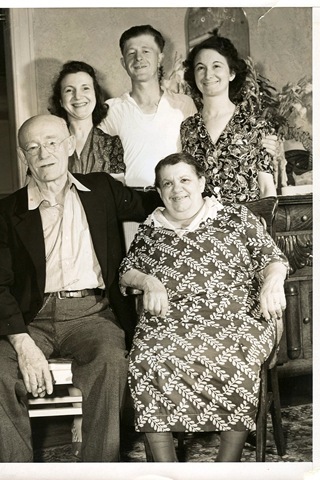 This picture shows my great-great grandparents, Soloman and Rachel Frank, seated, at their 50th Wedding anniversary party, with a friend of the family, son in law Everett and my great Aunt Gene, sister of my great Grandmother Miriam. I hope everyone got the gifts of their dreams!!! Your answers were fun and varied, and I am sorry to say I haven’t tallied it all up…will do for next year!! Here are MY answers! Favorite Novelty/Child Song Rudolph The Red Nosed Reindeer, Perry Como version.